Firstly, let’s take a quick glance at disposable batteries, assuming your device is using AAA / AA / C / D / PP3 cells. Disposables are not always the first choice for use in the field as ongoing costs can become expensive – but there are two distinct advantages: ‘starting’ voltage and (arguably) roll off. Disposable batteries such as the aforementioned (with the exception of PP3) come charged with 1.5V of power, unlike their same-sized rechargeable counterparts which tend to (once you have charged them) start their lives at 1.2V. Another factor is “roll off” – the way the voltage drops over time during use. Alkaline cells tend to have a gradual roll off in voltage over time if used in a consistent fashion, which can be useful if your equipment can give hints the battery is running low. Rechargeable cells tend to hold a constant voltage longer (which in its own right is an advantage) – but tend to then drop below a useful voltage quicker than an alkaline cell. Of course, certain equipment does not give the luxury of allowing the user to pick what battery to use and instead comes with a specialist rechargeable battery. Speaking generally, there a few very popular types that are used, be it; NiCd (Nickel Cadmium), Ni-MH (Nickel Metal Hydride), SLA / LA ((Sealed) Lead Acid) & Li-ion (Lithium Ion) to name but a few. There are a few things to consider to ensure not only a long cycle time for each battery, but a long overall lifetime. 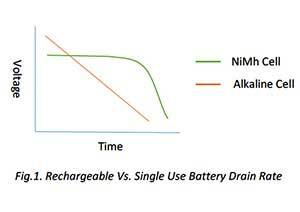 Firstly, if your battery is NiCd, NiMH or Lead Acid – it may suffer from the ‘Memory Effect’. This is when, if a battery is not fully depleted before charging, it may no longer be able to hold a full charge, thus meaning less functioning operational hours. As a general rule of thumb, each of the aforementioned cells should be completely flattened and then completed charged once every couple of months. The same is true for any device that has a battery gauge of some description (be that your laptop or even your iPhone!). If you want to keep that gauge accurate and reduce premature shut-offs (“Hey! You said I had 5% left!”) – then it is worth flattening and fully charging the device at least once every couple of months. Lithium – Ion cells are particularly popular in cameras. Two notes here: If you won’t be using a battery for a long amount of time, don’t leave it on the shelf fully charged. The magic number here is around 40% charged, then charge it fully before full use. If you find yourself in a situation where a Li-Ion battery needs to be stored fully charged ready for use, the trick is to keep it cool (around 15C). If you are working in a hot climate – these batteries will start to ‘leak’ charge at a higher rate if stored at temperatures above 25C. And with that – my closing tip: Batteries, like most middle-aged cameramen / women, don’t like sudden changes in temperature. If you are looking to get the longest life out of your battery (and cameraman / woman) – ensure that a constant environment is maintained for your cell. Ideally, this is around room temperature. Also ensure all ‘shocks’ are (i.e. leaving the warm of the truck for the cold of the football ground) are properly managed, providing insulation for the battery and maybe your camera staff if the budget permits.